As a spoken word or voice-over performer, I am a collaborative digital media artist. My canvas is the recording media, namely digital audio. My paintbrushes are the microphones and other recording tools that I use to generate the audio stream. 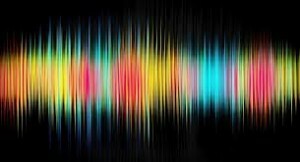 The colors are the range of my vocal repertoire, and sometimes the voices of other performers which I often direct and record. The inspiration is the script, the detailed framework from which the final project emerges. I perform a delicate and intricate dance with other contextual sound elements, such as music and sound effects, as well as any visual data that I am made aware of. The collaboration is furthered and enriched by my interaction with the producer, director, sound designer, editor, casting personnel, client, and others who have a creative stake in the project. These individuals provide details and suggestions which are welcomed, and then incorporated into my voice portrayal. The whole participatory, collaborative process can be mystical, even magical. When creating from scratch, I seldom see any video as I work, except under certain circumstances. I mostly have to rely on imagination and my abilities as an actor, storyteller, and communicator in an attempt to envision the final product and embody the vocal personality that best fits the story and communicates the right message. The work of my collaborators is also about their imagination and unique ability to create their portion of the media puzzle, coupled with the artful, skillful way they infuse our collective vision into the visceral experience of the final product. We all utilize specialized tools to generate individual products that, in the end, can be combined and layered with relative ease, forming the final production. To see and experience the portion that I participated in creating, joined with the elements created by others into the finished product, is an emotional thing for me every time it happens. I will never become tired of that feeling. There are many dimensions that keep voice-over work interesting. Each different project genre, be it a TV or radio commercial, industrial, animation, documentary, video game, book, training/education, etc., requires a slightly different execution…there are different rules of engagement with each. One of the things that moves me and speaks to my creative self is the reality that each and every project is going to require something different, and that constant change keeps me on my creative toes. I have developed an extremely broad understanding of genre, style, context, and dozens of other aspects of media presentation, and this is in addition to my never ending quest for better voice control and continually improving ability to engineer the recording. I find it all exquisitely fascinating, and I will never stop learning new things…beautiful indeed, because I love to learn. I am pleased to be an instructor, teacher, and coach of other voice-over performers. Via formal classes, workshops, and private instruction, I have a unique way that I introduce the various facets of importance in voice performance to new performers, and do this along with providing an understanding of the business aspects of voice work, and an introduction to the leading edge recording technology and methods that all voice performers must comprehend and utilize. Thank you for visiting my site. Everything we create beings with a thought…an idea. I hope to have an opportunity to create with you.